Closed Saturday & Sunday unless there is a performance. 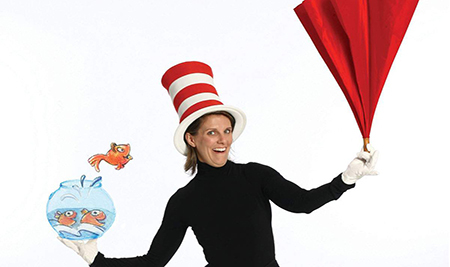 From the moment his tall, red-and-white-striped hat appears around the door, Sally and her brother know that The Cat in the Hat is the funniest, most mischievous cat they have ever met. With the trickiest of tricks and the craziest of ideas, he is certainly fun to play with. And he turns a rainy afternoon into an amazing adventure. But what will Mum find when she comes home...? This program is approximately one hour in length, and is appropriate for grades K -4. Copyright � 2013 Luhrs Center. All Rights Reserved.